Mr. Huffman grew up in Scottsdale and attended college on both coasts of the United States and Europe. He graduated from the University of California Santa Barbara with a history degree and received his teaching credentials from the University of Arizona. Mr. Huffman spent nineteen years teaching History and English; several of those years were with SUSD at Yavapai Elementary School, Supai Middle School, Coronado High School. Finally, he taught AP United States History and Advanced English Westview High School in Tolleson before moving into school leadership. Most recently, he was assistant principal at Madison #1 Middle School in Phoenix. Mr. Huffman is married to Heidi, a Cocopah and Chaparral grad who keeps him in line every day. They have three children – a daughter, Emily, who attends college in Chicago and two boys, Caelan and Ethan, who attend Sandra Day O’Connor High School. 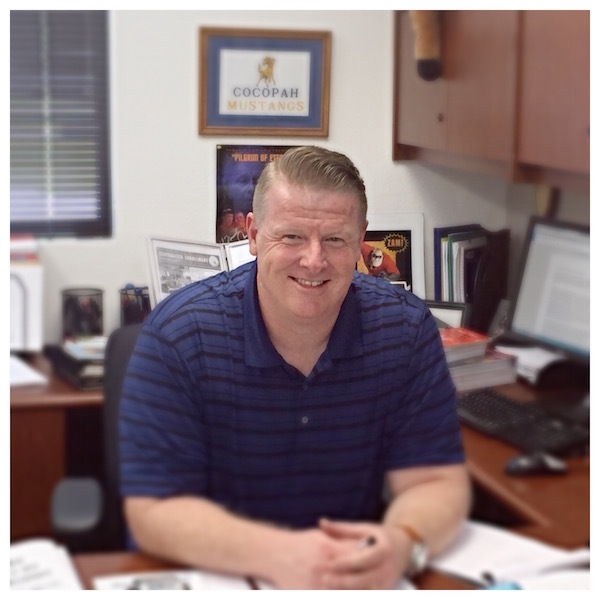 Welcome to Cocopah, Mr. Huffman!